Gudrun met Magdalena Gonciarz in Dresden. They sat down in a very quiet Coffeeshop in Dreikönigskirche and talked about their experiences as scientists giving science an image. Magda started Portrait of science in 2016 with two objectives: to show that science is a process with many contributors at all carreer levels and to have a get-away from a demanding PhD-project, to express her creativity and have tangible results. The person who pointed Gudrun in Magda's direction is Lennart Hilbert, a former co-worker of Magda in Dresden who is now working at KIT on Computational Architectures in the Cell Nucleus (he will be a podcast guest very soon). On the Portrait of Science page one can find photographs of people from Dresden's Life Science campus. Apart from the photographs, one can also find their stories. How and why did they become scientists? What do they do, what are they passionate about? Magda invites us: "Forget the tubes and Erlenmeyer flasks. Science is only as good as the people who do it. So sit back, scroll down and get to know them looking through the lens of Magdalena Gonciarz. Have you ever wondered what kind of people scientists are? Would you like to know what are they working on? What drives and motivates them - spending days in the basement without the sun? Portrait of Science project aims at uncovering more about people who contribute to science at all levels - Research Group Leaders, Postdocs, PhD Students, Staff Scientists and Technicians. All of them are vital for progress of scientific research and all of them are passionate people with their own motivations." When she started the Portrait of Science project, Magda challenged herself to take more pictures. She wanted to show the real people behind science and their personality. This was a creative task, quite different from her work as scientist - done with comparably little time. On top of taking the pictures, interviewees were asked to fill out a questionaire to accompany the story told by the photographs. Surprisingly, the stories told by her co-workers turned out to be quite inspiring. The stories told have shown the passion and the diverse motivations. People mentioned their failures as well. There were stories about accidents and their crucial role in carreers, about coincidence of finding a fascinating book or the right mentor - even as far back as in early childhood sometimes. Sharing ups and downs and the experience that there is a light at the end of the tunnel was a story she needed and which was worth to be shared. Knowing how hard scientific work can be, and how multiple friends and colleagues struggled more than she herself, Magda still strongly feels that it is useful to show that this is not a private and unique experience, but probably a part of the life of every scientist. This struggle can be overcome with time, effort, and help. Magda comes from Poland. During her Master's studies, she had an opportunity to do a research placement at the University of Virginia. During that time she felt welcomed as part of a scientific community in which she wanted to stay. It was a natural decision to proceed with a PhD. She applied to the very prestigious Dresden International Graduate School for Biomedicine and Bioengineering and joined the biological research on proteins and their modifications in the lab of Jörg Mansfeld. After finishing her project, she decided to leave academia. Since 2018 she works for a learning and training agency CAST PHARMA and is involved in producing e-Learning solutions for pharmaceutical companies. Magda also talked a bit about her PhD research. As we all know, genes code for proteins. However, one protein can exist in multiple different forms with multiple varying functions. A protein can be post-translationallly modified, i.e., modified after it is created in order to e.g., be relocated, have different interaction partners or become activated or destroyed in a manner of minutes. Recently, modern methods such as mass spectrometry, made it possible to see the multitude of post-translationally modified forms of proteins and allowed further research with the use of biochemistry or imaging techniques to gain insight into functions of these modifications, e.g., at different stages of the cell life. Gudrun and Magda also talked about the challenge to make a broader audience understand what the particular research topic is all about. It is hard to refer to things we cannot see. It is often easier for people with more translatable research to connect it to various diseases, e.g., cancer but still creates a challenge for those working with more basic issues such as developmental biology. What Magda took from her time in academia is much more than her results and her part in the basic research story. She feels that curiosity and quick learning skills are her superpowers. She is able to become familiar with any topic in a short amount of time. She can manage multiple parts of a project. Also she learned resilience and how to deal with challenges and failures on a daily basis, which can prove to be helpful in all areas of life. At the moment, she is still making plans whether to continue the Portrait of Science in the future, maybe in a changed format. 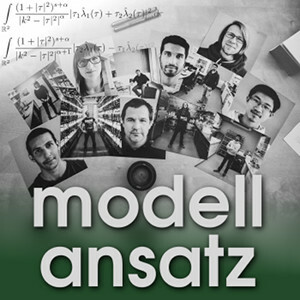 A. Leßmöllmann: Wissenschaftskommunikation, Gespräch mit G. Thäter im Modellansatz Podcast, Folge 130, Fakultät für Mathematik, Karlsruher Institut für Technologie (KIT), 2017. C. Rojas-Molian: Rage of the Blackboard, Gespräch mit G. Thäter im Modellansatz Podcast, Folge 121, Fakultät für Mathematik, Karlsruher Institut für Technologie (KIT), 2017.